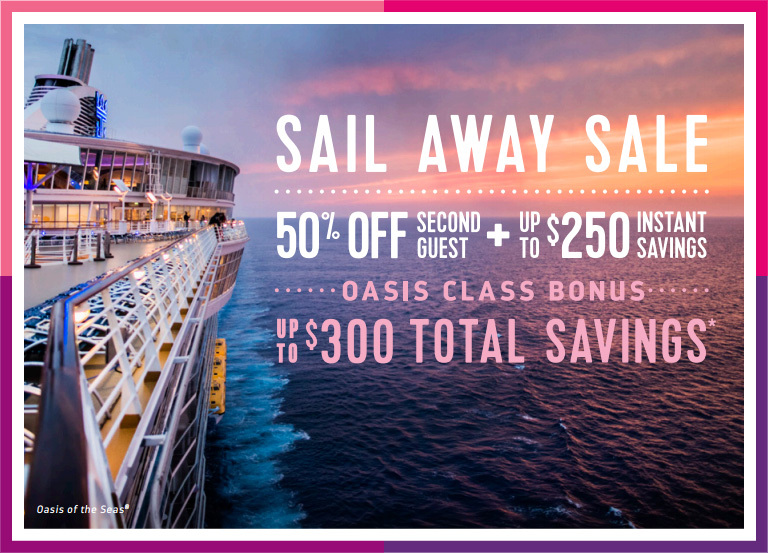 Royal Caribbean cruises booked this weekend are eligible for bonus savings on top of the current BOGO deal. Cruise must be booked between 8/11/17 through 8/14/17 12:00 AM EST and applies to sailings departing on or after 9/11/17. Offer excludes China departures. Kids Sail Free offer is valid on 4-night or longer Europe, Bahamas, and Caribbean Sailings departing 9/11/17 – 5/15/18 excluding holiday sailings departing 11/17/17-11/27/17, 12/17/17–1/8/18, 2/15/18-2/20/18 and 3/10/18-4/1/18. Deck the Holidays Deals offer provides savings for guests who book a holiday sailing departing from 12/19/17 through 12/31/17 and 12/18/18 through 12/31/18. Additionally, guests who book a Harmony of the Seas, Allure of the Seas or an Oasis of the Seas sailing departing on or after September 11, 2017, will receive an additional $50 savings per stateroom. Sail Away Sale is combinable with Deck the Holidays for savings equaling: $50 off per stateroom for Interior and Ocean View on sailings 5 nights or less, $100 off per stateroom for Balconies and Suites on sailings 5 nights and less, $100 off per stateroom for Interior and Ocean View on sailings 6 nights and longer, $175 off per stateroom for Balconies on sailings 6 nights or longer and $250 off for Suites on sailings 6 nights or longer.